“Where there’s a will, there’s a way!” We have heard this saying many times. And if politicians and authorities would think about it, fewer people would be sitting in jail waiting for trial for minor, non-violent offenses. Other people have committed more serious crimes and gotten out of jail the next day. Just because they were able to pay their bail bond. While people from backgrounds of poverty sit in jail for months, even years, because they cannot afford their bail. Activists of Criminal Justice Reform in New Orleans have been fighting vigorously these past months against mass incarceration. They have participated in town hall meetings, held press conferences, and organized overnight vigils in front of the jails, holding banners and shouting, “No more bail bonds,” “No more beds,” “No more jail buildings,” and “Decarceration now!” Also, they have used social media networks to voice their frustration at not being heard by the criminal justice system. They have held meetings with council members and asked the city council and the sheriff to stop incarcerating people. Just because they cannot afford their bail bond or because they are mentally ill.
What is the purpose of incarcerating non-violent black people who live in poverty? According to the Vera Institute of Justice report on the economic consequences of cash bail in New Orleans, a portion of every defendant’s bail is used to finance the city’s criminal justice system. Of each bail payment, 1.8 percent goes to the Judicial Expense Fund that pays for travel. Also some money goes to attendance at conferences, and coffee and bottled water for judges and deputies. The report estimated that in 2015, defendants and their families paid $9.2 million in non-refundable payments to the courts and the private bail industry. Astonishingly, a judge said in a court hearing that use of bail payments of criminal defendants was reasonable. Because he said“the court’s gotta eat.” Judges, deputies, and other court personnel should not depend on money from people who live in poverty to eat, travel, and pay for their coffee. It’s a terrible shame! “The ordinance requires people charged with most municipal offenses to be released after they’re booked into jail if they promise to show up in court. The amendments focused on setting an initial hearing within 24 hours. Thus making some crimes, like domestic abuse, battery and illegal possession of a weapon, not eligible for automatic release. The new law would not affect the pre-trial jailing of those charged with felonies. Judges can impose bail if the accused commits another crime or skips a hearing. 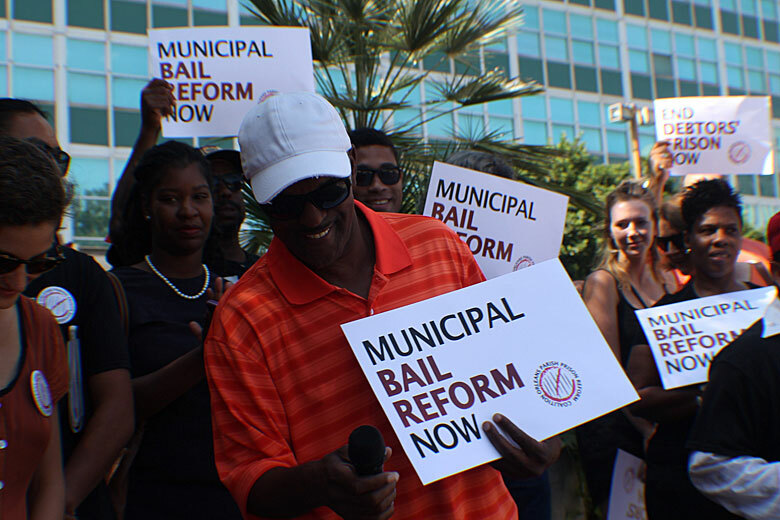 As the City centered on the fairness of ending cash bail, others said taxpayers would save money by reducing the number of people held in jail as they await trial for petty crimes. All of us were happy with this minor victory, although there is still a long way to go to stop mass incarceration. We need to rejoice in a victory when politicians and authorities started to change their thinking in relation to the mass incarceration of people in poverty. However, we need to do more. We will continue to work towards real justice in the criminal “justice” system. More information on ATD in the United States.